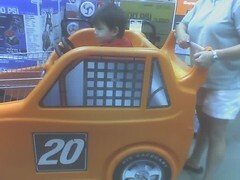 Home Depot has these new NASCAR/Tony Stewart shopping carts. They are HUGE and hard to steer, but Jack loved it. Makes going to HD a little more bearable. He still wanted to get out and sit on the tractors, though. Every single one of them.